Billy Ray said Summer was a witch. He said that because ever since she was nine, she knew how to blow smoke rings out of her nose. Not too many years had passed since. She still stood the same way. Right arm across her chest, left hand holding the cigarette at that jaunty angle she preferred. Her blonde hair, sent white by the sun, swept across her forehead and shielded her eyes. She wore that clever, knowing look the adults didn’t like too well. Thirteen-going-on-thirty, her mama, Doreen liked to say. And this was understood by all. They nodded their heads. Agreed it was so. Summer only stopped smoking long enough to dance. And when she did, all who saw, tutted and shook their heads. A young girl shouldn’t dance that way. Some said the devil had gotten into her crib as a baby, fed her honey in her milk and made playful friends. She laughed at nothing. Needed no liquor, like the old boys used for making jokes and fights. They could see her invisible dance partner in the way she moved her arms, holding onto his invisible hand, holding him up. ‘I wouldn’t watch her too long, some of that might wash off on you,’ Doreen said. Sonboy showed that gummy grin of his. The one that made the others worry. The one that said maybe having some of Summer – some of anything – rub off on him mightn’t be so bad. Jim got Summer working down at the Sideways Diner. Something to do with idle hands. Jim was a bear, big hands and feet on a frame twice that of any man in town. Summer liked the way he looked, with that too-small pinny pulled tight around his waist. He looked to her like the father of stray things. And wasn’t that what she was? A stray thing, a wild thing? Everyone thought so. She knew. Billy Ray came in to order coffee, and look at Summer. He licked his lips and tried to look thoughtful whenever he caught her eye. ‘You here to catch flies, boy,’ Jim said. Billy Ray asked for his coffee in a voice so much smaller than he’d rehearsed. Jim nodded for Summer to go get it. She placed a mug in front of him, took the coffee jug from the hotplate and made to pour. Billy Ray went for the sugar, his hand brushing hers. Summer felt struck. She jumped back, tipping hot coffee onto her own hand. And it was. Her skin, the softest white, showed no blemish. She doesn’t burn. They were all thinking it. Jim passed Summer a mop for the spill. He looked down and saw her bare feet. How come he hadn’t noticed before? Sonboy breezed in, slamming the open door closed behind him. The heat trapped inside. He had two dead rabbits slung over his shoulder. Their feet tied together. Summer kept watching their dead black eyes. Doreen was one of those self-denying women. Years of living on barely more than coffee and cigarettes and always saying I couldn’t possibly to another piece of pie. Sharp tongue one minute, sweet as candy the next. Fresh into her thirties, and already inspecting wrinkles in the beauty shop mirror, applying creams to fill them in, bleach to turn her hair the colour the sun blessed Summer with. Summer shrugged her shoulders in a don’t-know-don’t-care way. Summer smiled. She still had that tooth missing in the front. ‘You look pretty, mama,’ she said. Prettiness didn’t matter to Summer. She was thinking about things that die, things that are hunted and eaten. She’d ask Jim later what he knew about it. Billy Ray was to take Summer to the travelling fairground. He’d been persistent with his invitations and Doreen insisted Summer accept. ‘It’s nice to have a beau, Summer darlin’. You just be careful now. You know what I mean.’ Doreen raised eyebrows to show how serious she was about that. Billy Ray knocked on the grate and then stood in the doorway, like somebody who needed permission to enter. Doreen left Summer in her room and went to answer the door. Summer could already smell that pink, sticky cotton candy smell. It might have been Billy Ray who smelt that way, sticky and pink. She tucked her jeans into boots that were too big and was ready to go. Doreen did her proud mama bit and stayed waving in the doorway until they were out of sight. Billy Ray took a flask from his hip pocket and held it out for Summer. She shook her head. That smell. It was drunk-making enough. Billy Ray shrugged and took a swig. ‘What do you wanna do first?’ he said. Fairground lights beckoned in every colour. They were the whizz and sparkle of dreams. And such giddy names. Tilt-a-Whirl, Helter Skelter, Zipper, Sizzler Twist. A ride named for a dance had to be for her. They ran for the nearest car, strapped themselves in, laughing at the good fortune of not having to wait. Summer was already dizzy, and when the ride started it was catching up to where she already was. Lights flashed in lightening strikes and broke the darkness into little pieces. Music thumped out from under her seat, across her arms and face. She closed her eyes, laughed, shrieking, free. Her hair was as loose to the air as her arms were, and she swayed faster and faster, with every turn. Best of all, the cotton candy smell was gone. Now it was dark wood, charcoal and smoke. Deep earth, damp leaves and burning logs. It felt like the world was on fire. She felt them slow, and then stop. When she opened her eyes, Billy Ray was watching her, soaking her up. Their car had swung round, towards the back of the ride, away from view. It was just the two of them, stuck somewhere in the dark. Billy Ray leant forwards, mouth on hers, hands looking for breasts that had only just begun to grow. Summer pulled away, fought for her breath. Summer unbuckled and fled. She’d lost her land legs and tripped once, twice, getting down from the waltzer. There were too many bodies in her way. She had to use her elbows to find a way through. Doreen was stumbling around the kitchen, fetching glasses and that bottle of good rum she’d hidden there someplace. She stood up, too fast, and hit her head on an open cupboard door when she heard Summer in the doorway. Summer saw the look in her mama’s eyes, and something weary that lived inside her went to sleep and never woke again. Jim told Summer that dark moon time was the best time for hunting. He pulled up a chair, sat on it backwards with his legs straddled across the seat and drew her in. Summer had never heard Jim talk at such length about anything. ‘You don’t want them to see you coming,’ he said. Summer thought she would be looking for something a lot smaller than a deer, or a hog. Whatever it was, she wasn’t going to kill it. ‘Oh, they won’t see me,’ she said. Summer went hunting anyway, and she found exactly what she was looking for. The baby had a golden curl kissed to its forehead. It made a lovely gurgling sound that reminded her of a cat’s meow. She held it to her hip and walked with a little limp to balance the weight of it. Wasn’t it the most natural thing in the world? The townsfolk watched her out of the side of their eyes, talked about her out of the side of their lips. The questions, the guessing games. What no one said was that child looked exactly as Summer had at that age. Maybe Doreen would realise, if only she’d stand still long enough to notice. Doreen stopped the clatter, wiped her hands on a tea towel and muttered something Summer wasn’t supposed to hear. Surely, mama had some heart for loving someone, some time? It was too late to ask. Summer heard the grate slam shut. The sun was blind light. It bleached out everything that couldn’t hold onto its silhouette. Summer took the baby out to the highway. She lifted her thumb to the sky. If you wanted to start new, you just could. A girl with her talents. That road could lead to just about anywhere. 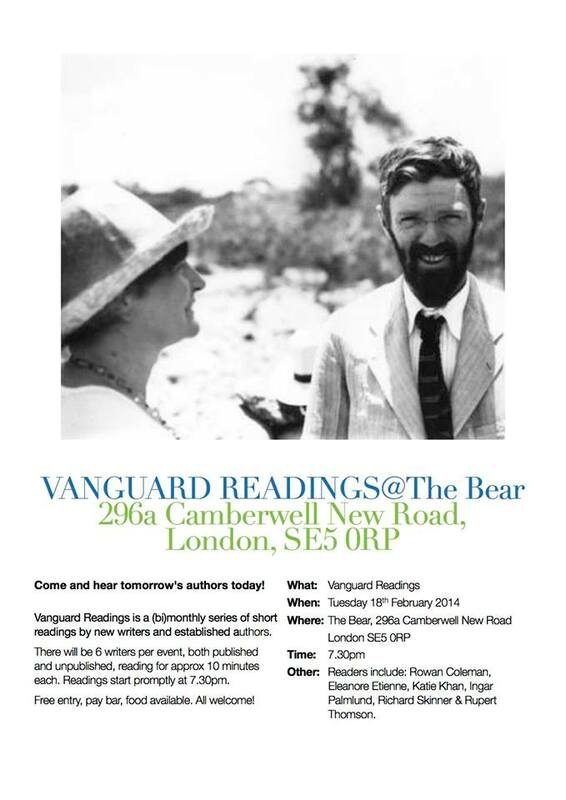 Summer was read at Vanguard Readings in February 2014.